By now, the fiasco that was the #myNYPD campaign is well known, with Twitter quickly taking over the hashtag promotion, which was supposed to display New York's Finest at their friendliest, and turning it into a channel to speak out (with withering sarcasm) about police brutality. As it turns out, however, NYPD Commissioner Bill Bratton isn't too bothered by the whole debacle, saying that the attention was fine. 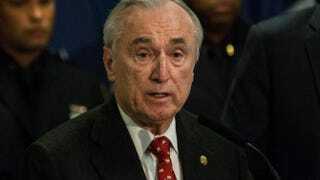 "I kind of welcome the attention," Bratton told New York's Daily News on Wednesday. "We really broke the numbers yesterday." Of course, more negative publicity couldn't possibly have been what the department was going for, but Bratton brushed aside the photos—which show police officers forcibly restraining individuals, as well as more-unpleasant images—as "old news." "Most of the pictures I looked at, they’re old news," he said. "They've been out there for a long time. "Oftentimes, police activities are lawful but look awful," he added. In fact, Bratton appeared to be open to even more photos, encouraging citizens to share their opinions. "Send us your photos, good and bad," Bratton told the news site. "I am a strong supporter and advocate of social media."